I wanted to make the Cavern strange, slightly out of place in Vvardenfell. As if the Azura's Realm, Moonshadow, is so very close that it shines through. Or as if this cave itself belongs to that Realm. 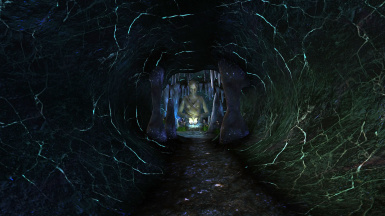 The Cavern of the Incarnate and the Azura statue meshes are replaced with bump-mapped ones, there are some flowers, grass and tiny fireflies. I changed armor and clothes on some of the ghosts, so that now an ashlander wears ashlander clothes, a warrior of the Temple - Indoril armor, Erur-Dan wears his cuirass, Hort-Ledd - his robe, etc. Lighting in the Cavern has been changed in order to make glow-mapped meshes to stand out better. Tribunal expansion is required, but I suppose everyone has it now. 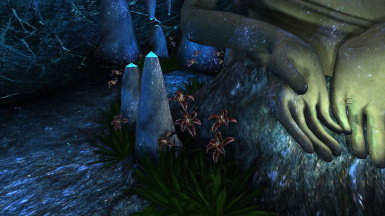 Optional: pluginless replacer of the Cavern and the statue meshes only. This mod contains bump maps, so in order for them to be displayed correctly you should use Morrowind Code Patch and turn on "Bump/reflect local lighting" option. MGE XE is also required.